Actually, we’re not off on our hols for a couple of weeks yet, but we are officially in Summer Holiday Mode because the children finished school on Tuesday at 12.20pm (random time). Knowing how difficult it is to get myself sorted to run when the kids are home I very wisely did my long run on Monday. How smug did I feel? Actually I felt hot, sweaty and tired, but I’m sure smug was in there somewhere as well. Since then – nothing. As predicted I have failed to get out running for all the rest of the week. “I’ll wait until the kids get up and then go” (always going to be a fail with a teen and an almost teen. By the time they get up it’s lunchtime). “I’ll go this evening when its cooler” (thanks to this summer’s surprise heatwave it hasn’t been cooler until about midnight, and that’s a bit late to run). The best one yet, on Friday, thinking I’d have a good breakfast ready for a hard session. Then I decided I’d better let it digest, so thought I’d go back to bed and catch up on Facebook and Twitter for half an hour. An hour and a half later I woke up with my phone stuck to my face, and still no run done. Don’t know why my site isn’t working 🙁 need to do some investigations …. Posted on 17/07/2013 Categories Uncategorized2 Comments on Help! So July 2013 has finally remembered its meant to be the SUMMER! Someone’s flicked the thermostat up to HOT!!! The cats are lying in strange places around the garden (either flaked out on warm patio slabs, or hiding under shady bushes), the garden is blooming (although the lawn is starting to look a little brown and crispy in places), and British people are getting used to not taking a cardigan and waterproof jacket with them every day ‘just in case’. One problem with the heat is that running suddenly becomes much harder work. What was meant to be an easy 3 mile run, becomes a sweat-soaked struggle with a sky high heart rate. Apparently after 14 days your body starts to acclimatise to the heat, so the trick is to struggle through the next two weeks and hope your body feels happier in the heat after that. So, to help you though those 14 days, I give you the Black and Tabby Guide to Hot Runnings. 1. Be prepared to sweat. Its your body’s mechanism to help cool itself down. Its perfectly natural. It doesn’t mean its pretty though. Make sure you’re wearing running kit that’s really comfortable. If you occasionally get a little bit of chafing somewhere, then make sure you use something like Bodyglide, or good ol’ fashioned Vaseline in the appropriate area. If you’re self-concious of sweat marks on your clothes, then don’t wear clothes that are going to show them. I have a new running t-shirt, in a gorgeous plum colour that I bought to reward myself for a good Marathon this year. I’ve worn it lots because its light, fits well and is loose rather than clingy. Unfortunately it also shows any sweaty places, no matter how strange. I give you exhibit A. Tummy sweat marks. Also be aware you may sweat in places you didn’t know you could. 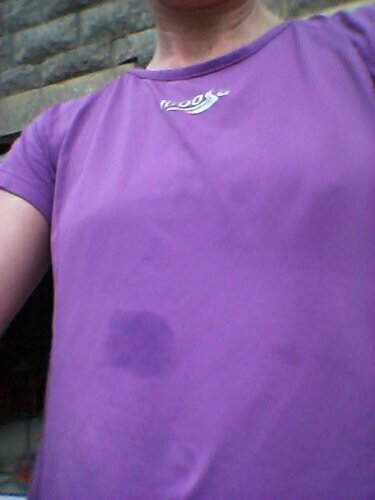 As well as the strange tummy sweat marks, I discovered only this week that on a hot run I end up with sweat dripping from my elbows. Who knew, eh? Make sure you apply an appropriate sun cream before you set out. Give it time to soak in to your skin, and make sure it can cope with sweat. Yesterday I picked up the wrong bottle, and covered one arm in a quite expensive sun cream especially for your face. (I bought it last year, but stopped using it when I realised it just made my face extra shiny). The other arm had my usual sun cream on (bargain, half price own brand from Superdrug, non-animal tested, good for the whole family). After a hot 40 minute fast-ish run, I discovered that only did I have sweat dripping off my elbows again, but the arm with the expensive ‘face’ sun cream also had sun cream dripping off. 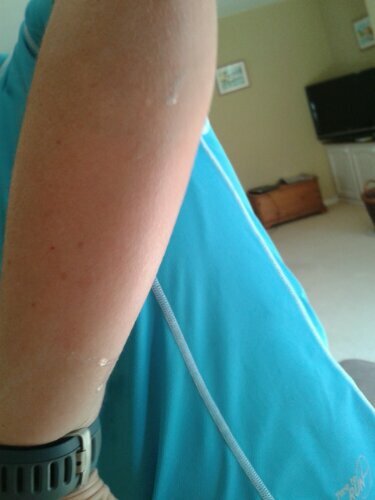 I could see the track of white cream from the crease of my elbow, down to my elbow, and then down to my wrist. There are sun creams that specifically say they are sweat proof so it might be worth trying one of those. I’ve never used one, but am happy to hear any reports of good brands that won’t leave me with white tracks on my arms. Obviously if the sun is strong then you need to protect your eyes from the UV rays as well as make it more comfortable to see where you’re going. Sunglasses are good, obviously wrap-around styles are going to protect more of your eyes than the latest fashion glasses, but as long as they’re comfortable to run in and have proper UV filters they’ll be good. An alternative to sunglasses that I’m only using for the first time this year is a running cap. Previously shunned as looking ‘too geeky’, I decided to give one a try earlier this year. (I was in Decathalon and it was a bargain, let’s be honest). 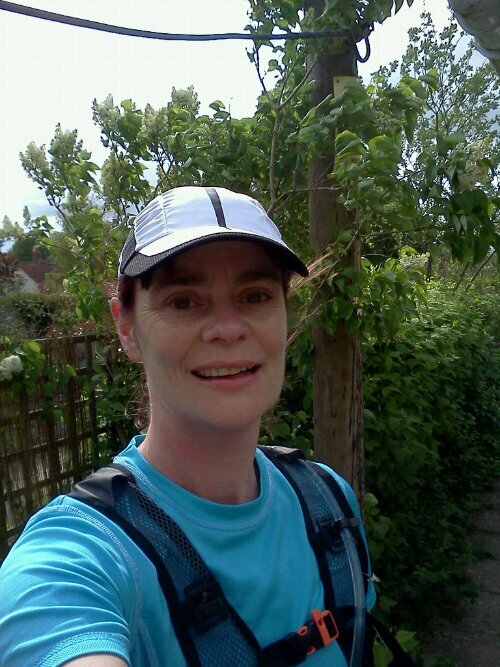 I have discovered that my cap keeps my face shaded so I don’t have to wear sun glasses as well, which is good as my best running sunglasses tend to pinch behind my ears after about 45 minutes). I guess keeping the sun from the top of my head is probably a good thing, although I do find my head gets pretty hot under there. I presume the next step would be a triathalon-style visor, but I don’t think even I’m ready for that level of geekiness yet! As you puff and pant along in the hot weather, you may well find yourself feeling thirstier than usual. Hardly surprising – think of all that sweat your body has made (I refer you back to Exhibit A above). I used to just take water with me, but I noticed I was getting headaches after long / hard / hot runs. I tried drinking more water, thinking I was dehydrated, but that didn’t help at all. It was only by chance I read somewhere that I could be losing too much salt, and I would be better off drinking an electrolyte drink, which contains the right balance of salts and water for my body. 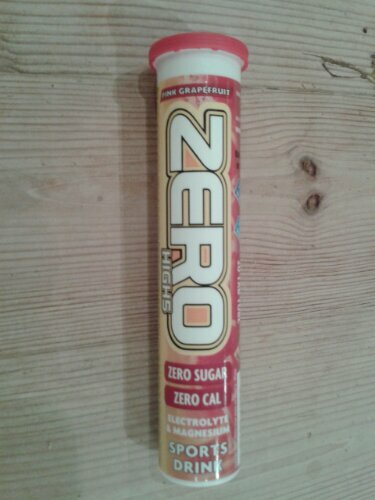 I dislike any sugary sports drinks, so I was very pleased to stumble upon High 5 Zero tablets. They were in my goodie bag after the Bristol Half last year so I decided to try them. They just dissolve in 750ml of water and are good to go. I find the taste mild and pleasant, not sweet and sticky at all, and easy to drink. My favourite flavour is the Pink Grapefruit, which is strange because I don’t actually like grapefruit. they have zero calories so are great to take on runs where I don’t need any extra calories. As an added bonus, my post-run-headaches have disappeared as well! Obviously everyone has their own tastes, likes and dislikes, and there are many different brands of sports drink, electrolyte drinks, powders and gels, so get out there and start tasting! 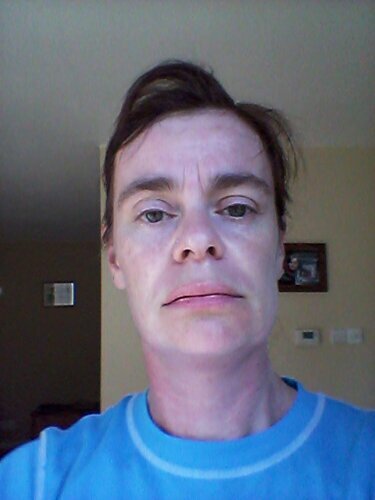 Even following all of my own advice, this was how I looked after my 40 minute slog in the sun yesterday. I think that may be it – I have used up all my words of wisdom. 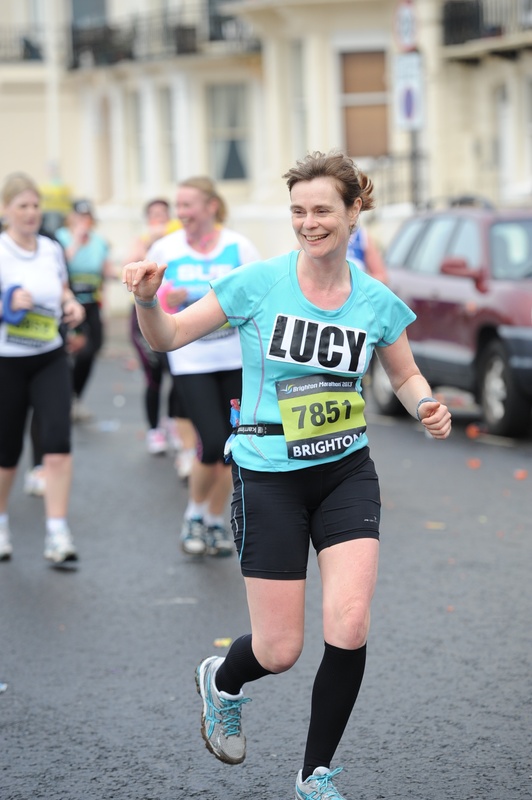 My final thought – if you can train through this hot weather, think how fast you’ll be at your Autumn race. And dream of how wonderful that first run in the rain will feel! If I’ve missed anything out, or if you have any top tips for keeping comfortable when running in the heat, please add your comments below. So, the challenge was to write an account of the funniest / most embarrassing / worst race experience I have had, in a competition to win a place on a Write This Run Running Retreat. Since I read about it, I have been considering all the funny, odd and strange things that have happened what I’ve been out running. I considered the time I was attacked by a psycho pheasant mid-run. I also pondered on the day I was feeling ill, decided to bail out rather than run the 4 miles back home, and caught a taxi back instead. It was a good plan, except I had to listen to the taxi driver regale me with stories such as “You know that chap that invented jogging? He died of a heart attack one day. It’s not good for you!” Then there was the time I saw a runner ahead of me elegantly slip through a stile rather than clamber over it like I usually do. I decided to do the same, except I was less ‘elegant slipping’ and more inelegant slipping head first right onto my face, following by wriggling to extricate myself. This afternoon I decided, in order to help me decide, that I should go back and read the flippin’ question (just like all the best exam advice). Good job I did, as I noticed this time the story had to be about a race experience. Facepalm! (as my children would say). I immediately though of something that had happened in this year’s Brighton Marathon. At about mile 15 I had a real wobble. I’d run such a long way, but there was still so far to go. My family hadn’t turned up yet, so I was feeling a little abandoned and really tired. I walked whilst I drank some water, ate some Shotbloks and gave myself a good talking to. After about 5 minutes of feeling sorry for myself I pulled myself together and started running again. As I ran, I wondered idly if I needed to find a toilet, just in case. Each set of portaloos I’d passed since the start of the race had had a queue outside, and I knew from last year how easy it was to lose 15 minutes queuing. I pressed on, but having thought about maybe needing a wee I was now becoming obsessed. For a couple of months before, I had been reading a series of books on my Kindle about a little old lady who turned out to be a brilliant detective. She realises that being invisible (as old people often are in this society) can be extremely advantageous, and that a grey haired ‘senior’ can get away with asking questions that a would arouse suspicion with a younger person. The lady in question was also a very committed Christian, with a slightly annoying habit of asking God what to do about any tricky situation she found herself in, with words like “Lord, if I should follow this man to see what he’s up to, then help me find a way to get through this barbed wire electrified fence”. At this point I was hot, tired and unsure if I was desperate or not. I was ready to try anything, and this book popped into my head. Feeling slightly silly, I said “Lord, if I should go to the toilet, show me one with a very small queue”. Blasphemous? Maybe, but I hoped it was more ‘ask and you shall receive’. I looked around, but couldn’t see any portaloos. Slightly disappointed I looked down the road ahead to the corner, and looked, and looked again, and gaped open mouthed. As the sun was already shining I can’t claim the clouds parted and a shaft of sunlight beamed down like a giant celestial spotlight, but in the film of my life that’s what will happen. Right on the corner was a church. Outside the church was a sign. A sign! A sign saying “Tea and coffee inside. Toilets” At the corner instead of turning left I dashed inside the cool church, panting “toilets?” to the ladies with the tea urn. They pointed the way, and I found myself in a clean toilet, with toilet paper and water to wash my hands. A little flushing oasis in the madness that is a marathon. ‘Ask and you shall receive” indeed! I felt so much better after this, and pressed on to finish in 5:25. Still slow, but a new PB of over 40 minutes for me. Thanks, Big Guy! 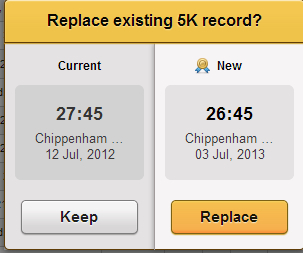 My once-a-year 5K race has rolled around again, on 3rd July 2013. I really should get around to doing a Parkrun and then I wouldn’t feel the ridiculous pressure of it being my ‘once-a-year’ chance to get a PB. It was a warm and sunny evening as I arrived at the Olympiad sports centre, and I collected my number without issue. 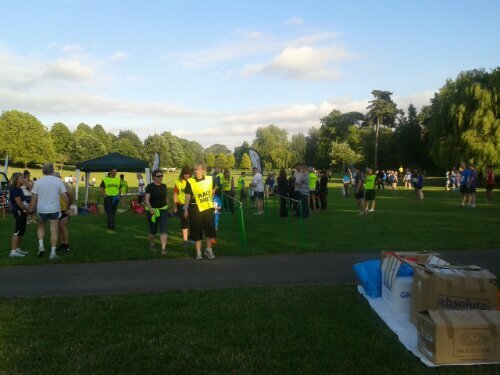 I made my way to the start area, and milled around with the other runners. There were a number of groups of runners from local running clubs and I did feel rather on my own. I think I was missing my running partner from the last 2 years. I had a little warmup jogette and found a railing to hang onto to swing my legs around in some dynamic stretches. I always feel rather silly and very self conscious doing these so I naughtily skimped on them and made my way to the start mêlée. A friend spotted me at this point and we had a little chat as we waited. The course goes right past her house, which must be a very strange feeling! We heard the race director shouting “3 – 2 – 1 …” We never heard “Go” but the masses pushing forward told us it was the start. As in previous years it was a mad rush for the first corner, where the course narrows from open grass to a single track path. I think I timed it just right this year as although the first dash felt way too fast, as I settled in line on the narrow path I was running with runners all going at the same pace as myself. It felt fast but do-able so I basically just hung on. At the slope where the route zig-zags up to the cycle path we all slowed down, and the guy in front of me actually slipped as he turned the gravelly corner. I slowed down even more as I’m a coward and I did not want to end up on the floor as well. The cycle path was slightly shady which was a relief as the evening was proving to be very warm and muggy, and then we were off the path and on the streets heading downhill back towards the start. I was starting to feel tired and hot at this point, and had to keep giving myself updates to keep going. I was telling myself I was half way, I only had a mile to go, just round the corner…. We left the road and headed back on the ‘single carriageway’ path. I unfortunately found myself behind a handful of runners who slowed down at this point. I was torn between gnashing my teeth in frustration, and being grateful for a chance to catch my breath. I managed to squeeze past them as soon as the path was wide enough, and headed over the grass to the finish line. My legs were shouting loudly at me, my heart was pumping, sweat was pouring off me, but did my best approximation of a sprint finish and made it to the line. As I stopped my Garmin, I saw the time – 26:45. I’d taken a whole minute off last year’s time. Another new PB? YES PLEASE! Replace my 5K PB? Don’t mind if I do!